On the 17th of July, the「Yamabokojunchou」took place and it was followed at nightfall by a festival called「shinkousai」. Actually the title role of the “Gyon” Festival is to set up religious services using the 「Omikoshi」. 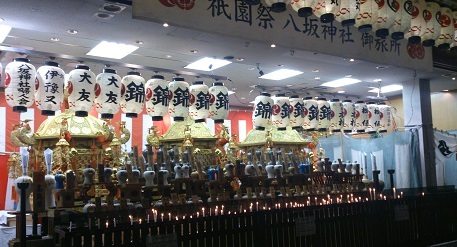 The Omikoshi is a portable shrine, which is carried in festivals. There are more than 1500 people who carry the Omikoshi. They are local residents worshiping the same guardian deity at the shrine Yasaka. 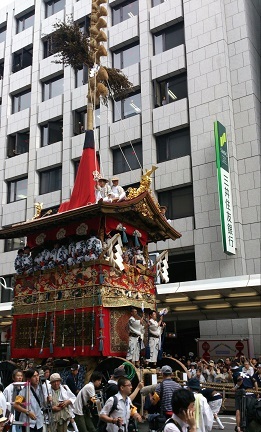 The parade goes until the “Otabisho” of the Shijou. 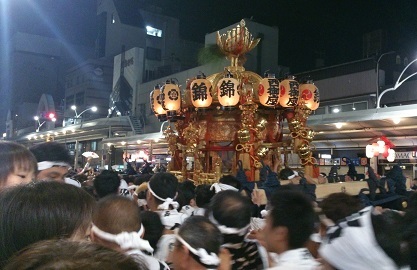 The Otabisho is a place where the sacred palanquin is lodged during a festival. On the 24th, the parade comes back from the Otabisho to the shrine Yasaka, which is the main shrine (Wasachisai). The “Yamabokojunshou” is said to be the festival of the「静 Shizu」and the “Omikoshi” is said to be the「動 Dou 」festival. The Omikoshi needs the power of all the people carrying it and it leaves a deep impression on everyone as a godsend. I particularly recommend to see these festivals for those who have not been able to see some yet. As the month of July is ending, only a slight trace of the Gyon Festival remains. After work, on the way back home, I stopped at Otabisho to make an offering lighting some candles. I wished that all the Shinto rituals would go off all right without a hitch. I feel also a lot of gratitude to have been able to experience the Kyoto Gyon Festival this year.